A lovely desert that’s as visually appealing as it is flavorful. Bake the gingerbread according to the package directions; cool completely. Meanwhile, prepare the pudding and set aside to cool. Stir the pumpkin pie filling, sugar, and cardamom into the pudding. Crumble 1 batch of gingerbread into the bottom of a large, clear bowl. Pour 1/2 of the pudding mixture over the gingerbread, then add a layer of whipped cream. Repeat with the remaining gingerbread, pudding, and whipped cream. Sprinkle of the top with crushed gingersnaps if desired. Refrigerate overnight. 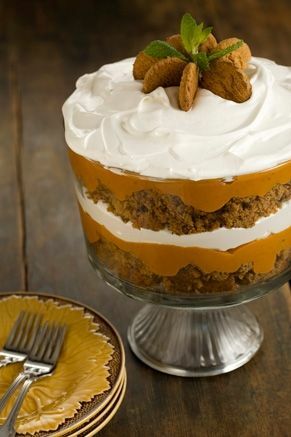 Trifle can be layered in a punch bowl.